Do you want to drive a full-size luxury sedan without the luxury price? Enter the Genesis line, producer of premium sedans for the masses. When you drive a Genesis sedan, you get the latest high-tech, comfort and convenience features of those high-priced luxury brands but at a much more affordable price. 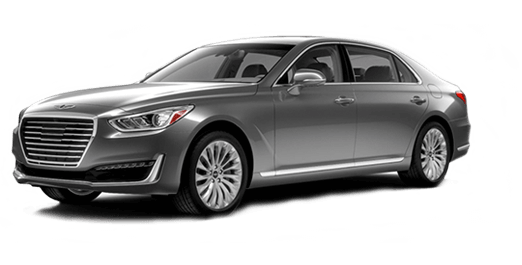 Luxury car buyers near the cities of Talladega and Tuscaloosa, AL, can get into a Genesis sedan in Birmingham, AL at Jim Burke Hyundai. Shop our online inventory now or visit our full-service Hyundai dealership in-person for a test drive. Learn more about these premium full-size sedans below! The Genesis should be a top choice for drivers who want a sleek, full-size sedan with high-end luxury features at an affordable price. Car buyers will find that Hyundai's Genesis sedan comes so well-appointed in standard trim, that there may be no reason to upgrade to a higher level trim; in fact, most features come as standard! The cabin's spacious seating for five plus generous cargo room in the trunk means that the Genesis is plenty roomy for five adults. Available features on late-model Genesis sedans include leather-trimmed seating for five, heated seats, a large touchscreen display, rearview camera, navigation system and Hyundai's in-car connectivity system, Blue Link. For a feature-rich large sedan at an affordable price, the choice is Genesis. Every Genesis sedan comes equipped with impressive power, in the form of a V6 or V8 engine. Rear-wheel drive (RWD) comes standard, with all-wheel drive (AWD) available for added control and traction. Hyundai's optional 5.0-liter V8 makes more than 400 hp in the Genesis sedan, which should certainly propel you to wherever you need to go in a hurry! A smooth automatic transmission with manual shift mode comes equipped on the Genesis for efficient power and on-demand shifting. To fully explore the luxury, refinement and performance of a Genesis sedan, a test drive is in order. If you are near Tuscaloosa or Talladega, AL, then visit Jim Burke Hyundai. Once you find a Genesis sedan you would like to call your own, our finance staff can assist you with the auto financing process. For routine maintenance of your Genesis, Hyundai or any other car down the road, you can turn to our auto service department. Experience the Genesis sedan at Jim Burke Hyundai today!